On Sunday 20th March 2016 the sun was shining and the day was perfect for a picnic. About 50 Red Hatters from all over Victoria converged on the lawns at the rear of Riverside Gardens Nursery at Emerald Bank, Kialla, near Shepparton. Princess Petal (scarecrow) welcomed all with a lovely smile and blink of the lashes. Before too long there was much joy and laughter from those present as they rekindled old friendships and made new ones. Some purchased hampers from a nearby eatery, The Provender, which contained more food than they could handle while others shared their picnic lunch. There was a lot of shopping carried out with the Red Hat merchandise present and the specialty shops that are at Emerald Bank including a patchwork shop with Red Hat fabric that was quickly snapped up. 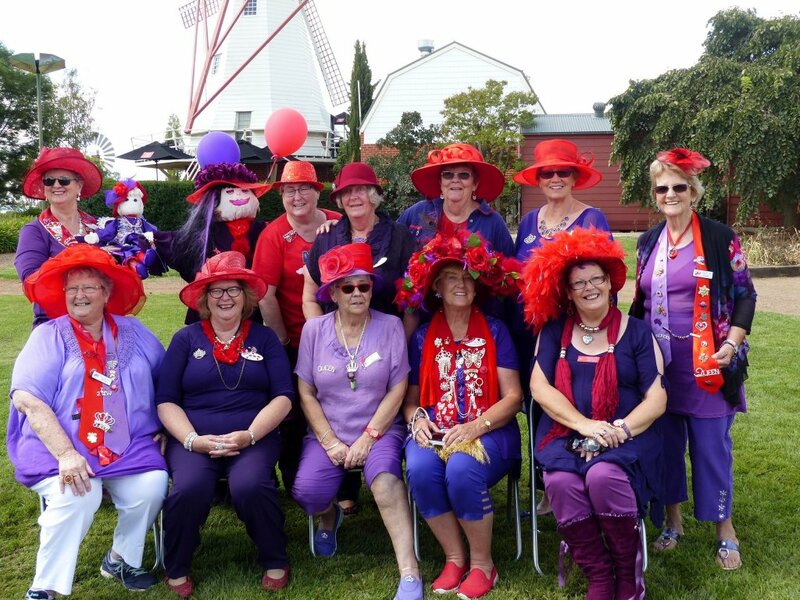 With the sale of raffle tickets, photos with Princess Petal and sale of pre loved goods we were able to donate $165.50 to The Good Friday Hospital Appeal on behalf of The Red Hat Society of Victoria.